Mary B. Bahr, 82, of W Foster St., Port Washington, Wisconsin died Tuesday, May 5, 2009 at St. Nicholas Hospital in Sheboygan. She was born March 22, 1926 to George and Anna Ellermann Augustin in Port Washington. On January 10, 1948 she married Alois Bahr of the Town of Holland, Wisconsin at St. Mary’s Church in Port Washington. A life long resident of Port Washington she always lived on the south side. She was a proud homemaker and active in the SHARE program, St. Mary’s Parish and the Port Washington Senior Center. 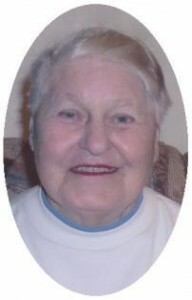 She was a dog lover and avid reader who enjoyed bird watching, gardening and playing cribbage and sheepshead. Her husband Alois preceded her in death May 19, 1991. Mary is survived by her children AnnMarie Bahr of Brookins, South Dakota, Joseph (Nancy Lois Emple) Bahr of Waterbury Center, Vermont and David Bahr of Port Washington, Wisconsin. Further survivied by brothers Norbert (Marie) Augustin and Leonard (Harriet) Augustin, both of Port Washington, half sister Eunice Colden of Wauwatosa, Wisconsin, other relatives and friends. Preceded in death by her husband Alois, brothers Fred, Leander, Ruben and Joe and a sister, Bernadine Possley. Rev. Tom Lijewski will celebrate Mass of Christian Burial 6 pm Wednesday, May 6, 2009 at St. Mary’s Church, 430 N. Johnson Street, Port Washington, Wisconsin. Interment parish cemetery. Visitation 4 – 6 pm Wednesday AT CHURCH with a 4 pm rosary.